I got it to work by implementing var_defs inside Spriter2Unity (but not the <meta> tag). It's not complete but for the moment it allows me to assign a SpriteCollection directly inside Spriter...It'd be cool if you could update your reference doc as well, I think that would make it easier to implement the various Spriter features. Ok I'll stop bothering you now with my posts haha. Thanks for reading. Glad you got your needs met. :) Edgar (Spriter's programmer) is working on a totally new, fully featured and documented generic Spriter implementation ( IO believe in C++) which will be a complete replacement of the old reference document. It's out top priority, but we can't yet say when it will be ready and released. I don't know if this is kind of a bug or a behaviour to be developed but the current scene and images do not follow OR display OR sync with all "Undo steps" visually... Undo steps are kind of happening silently and I can hardly tell where the change has occured if I'm on another frame... and when I return back to a previous frame I see that the action specific to that frame is "undone" indeed. This sometimes causes a little confusion even if we have history panel at the right lower corner since the actions written on the history are not named specific to frames. This can be enhanced a bit more, maybe? I'm sorry if this is a tired old question, but I can't seem to find any info beyond whats been posted 6+ months ago. It's regarding mesh/ skin deformation, has there been movement on this, have you been able to implement it like you wanted to? Any info would be much appreciated, thanks. I like the new shortcuts list! Any chance it'd be possible to change keyboard shortcuts inside the list in later releases? I got really comfortable using Ctrl+Shift+Z for undo, since most of the programs I use have it set to that instead of Ctrl+Y. Or is there a configuration file I can change settings in? Would we be able to attach the deformation points of images to individual bones? That way we could bend limbs, animate breathing by moving a chest bone, or make tails out of one long image. I'm new to animation but Spriter makes it easier to learn. I don't know if color blending or mesh subdivision has already been suggested, but I think it'd be pretty useful in some cases. Overall, the program is very slick and easy to use. Nice choice of colors for the interface too, keep up the great work! Pretty much everything you've requested/suggested is planned. We just can't say exactly how soon each specific feature will appear. The reference implementation will definitely come first, though. Thanks again, everyone, for your patience. Sorry for the huge delay on this feature. 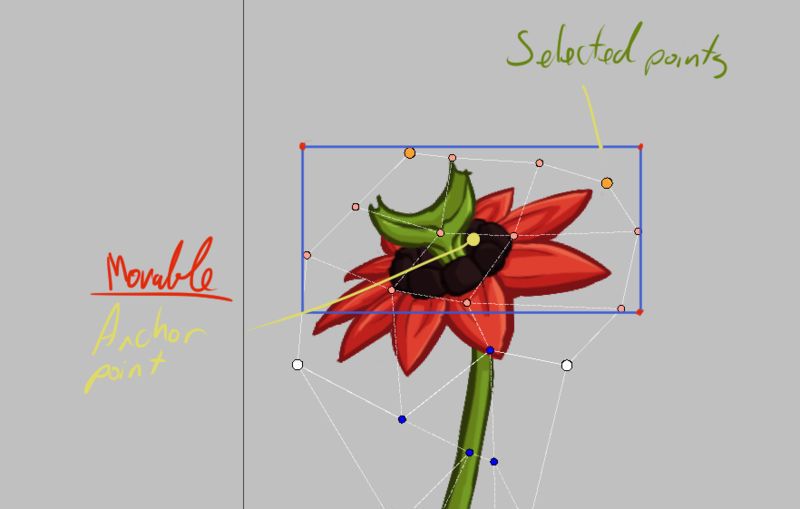 The reference implementation (the one that is taking longer) is the critical first step to finally get the deform feature into Spriter in as powerful, flexible and easy to use a form as possible. It's a feature we're really excited about too, and we very much regret the delay in bringing it to Spriter. We can only promise we'll do our best to make it worth the wait. I would love to have better folder/project management capabilities in Spriter. For example, when we change the folder structure of the project, Spriter may ask to locate the new folders for missing images when loaded. or can automatically locate the new pathways to images looking for file names (but this can cause a mess if there are many files with same names in different folders, so it might be better to use the "manual locating" as suggested in the above bold text). Thanks for the great suggestions everyone. Keep 'em coming. In a game I've been working on, I figured out how to code tweening using these examples and some allow over shoot and bouncing. Maybe Spriter could have an "Advanced tweening" option in the tween editor. Spriter Pro already offers lots of custom tween speed-curve options. Here are just a few things I would like to see in Spriter. I don't know if any of these are possible or being planned to go in Spriter anyway. I will list the feature then its functionality. 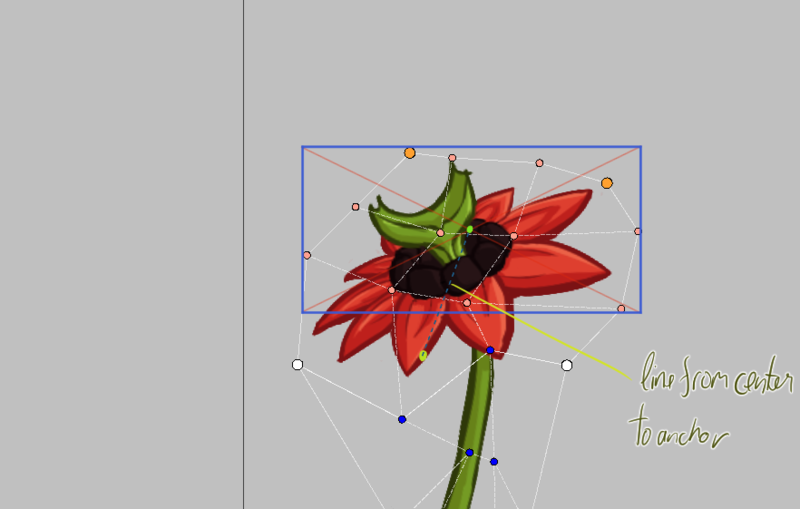 Import Illustrator files - This can be useful as layer and group information can be accessed from the .ai files all within Spriter. Not sure if it was mentioned (22 pages of suggestions after all :P); but I'd like to have a sprite repository per entity like we have with bones (using the obj_info). I'm currently working with Unity and it'll make it easier to optimize usage of in-scene gameobjects. It would be nice and very useful if there was an option like "bone length" near "scale" fields to change dynamically bone length after skeleton was created. One more thing. Copy and paste bones not only in one working window but between 2 opened instances of Spriter. Can you please explain more specifically what you want to do..you can already select a bone then change its length or width in the properties panel... Do you mean without effecting child images or bones? You could un-child the child objects to do that, then re-parent them. I think perhaps I just am misunderstanding what you want to do though. May be i'm looking into another direction, but i cant find these parameters in the properties panel. I see there only x, y, x-scale, y-scale, angle and alpha. I want a property which will allow to change those "w" and "h" parameters. 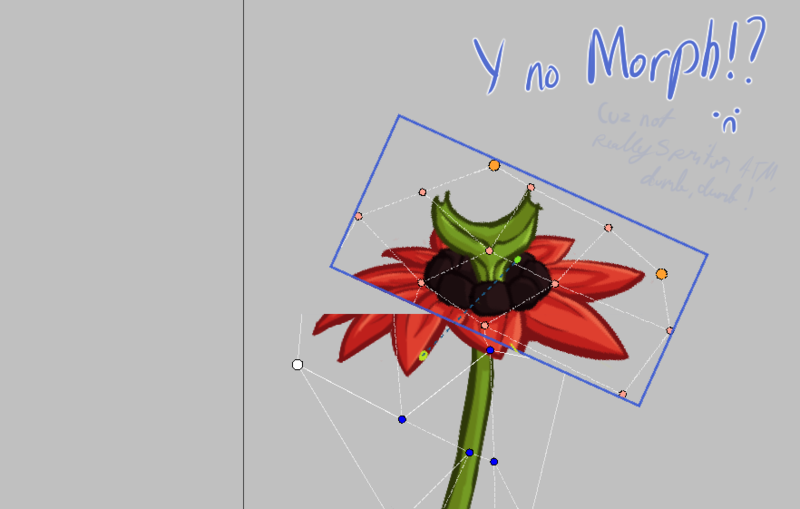 And copying and pasting functions are not working properly between two windows of Spriter. Eyyy~~!! 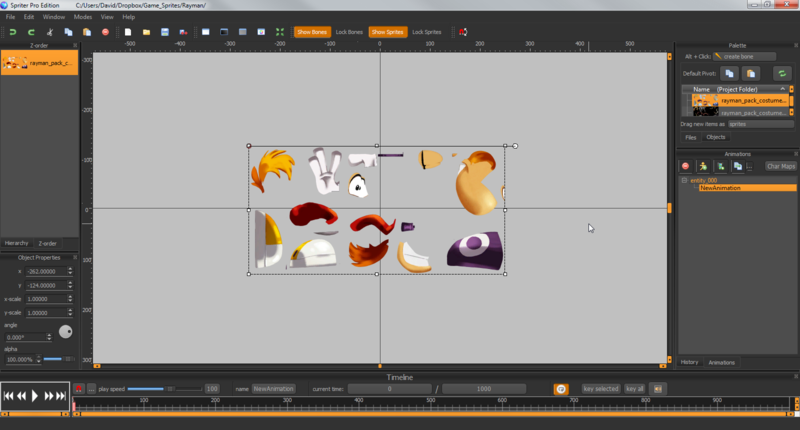 So i've got a few suggestions on how to beef out the feature set of Skins in Spriter. 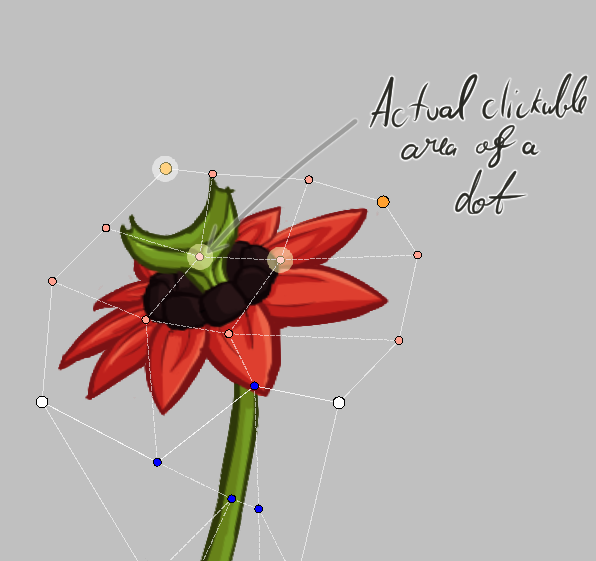 So while you're in the Skin mode and grabbin' a bunch of dots, it'd be nice have the ability to scale and rotate them as a whole. It'd also be really nice to have an anchor point that you can move around and use as the origin for rotation. Also, I think that the dots should have a bigger invisible clickable area. The dot size is nice, doesn't get in the way, but you should increase the size of it "invisibly" and add a subtle highlight to indicate, which point you'll be clicking. Ah, I guess you want to edit the bones "default" width and height? I'll pass the suggestion on to Edgar, and link him to this post. Thanks for clarifying for me. When selecting bones, sometimes it's hard to click them. Is there any chance of expanding the the selectable area around them? Right now it seems like the cursor can only select it if it's right above the bone. Maybe have a transparent border appear when the cursor is near? A checkerboard patterned background would be nice, maybe a toggle to overlay the pattern? It could just take the current color, invert the brightness value, and tile it with a low alpha value. Sometimes the blank canvas looks a little jarring, though I might be used to using art programs where transparency is marked in such a way. When I set a foot to be the end of an IK chain I would like to be able to then pick up the foot and move the leg by dragging a target helper object around. This would be the same for an arm, link a target object to a hand then drag the arm around like in other animation apps. Currently when I assign IK to the end of a chain it just gets anchored in place with a red dot and cannot be moved. The IK works in reverse as in I can move the body towards the anchor and the limb bends but this is not very helpful for creating walks and stuff. Would this be possible? I could see how moving the IK anchor point could speed animating in some ways. I tried separating each subject so it'd be easier to read since there was quite a few ideas I had, so if it helped I'll try to format my ideas this way in the future. Teaonabag why dont you just create a bone and assign skin to it , you will be able to rotate it and deform it. Just to clarify for anyone who is reading this thread, skin mode is currently a place-holder, proof of concept feature, and should be used at your own risk and with the understanding that any bugs found will not be fixed, and eventually the feature will be completely replaced with the real version, which most likely will not be compatible. Meaning at some point, a future update of Spriter might no longer support it and it's highly unlikely any Spriter implementation will ever support this current (place-holder) version of the feature. We apologize for the delay in making the real version of the feature, but we must finish the new reference implementation first, as it will introduce much more flexibility in the data management and manipulation needed to make the real skin mode as powerful and easy to use as we plan. Feature Suggestion: Batch Export that pays attention to Char Maps for EACH entity and not just the selected one.